I tend to lean towards foundations that have full to medium coverage. But there is a real struggle finding full coverage foundations that aren't thick, heavy and cakey on the skin. I have dry skin which makes this issue even worse! I do have a few foundations and tips that allow me to wear full coverage without the cakey face. So here they are. I like a good scrub to rid the skin of any dry patches and leave it super smooth. I really love this scrub from L'Oreal. It does a really good job of exfoliating the skin without leaving it feeling overly dry or stripped. It can also be used on the lips. Plus it smells amazing too. Next a good serum is essential to add hydration and ensure any dry areas don't come back. My current favourite is the one from The Ordinary. It's really light weight and fast absorbing so it's perfect for under makeup. It really helps to keep my skin hydrated all day to. See my full review here. Moisturiser is so important, especially if you have dry skin. I've been really enjoying this one from Kate Sommervile. It's super hydrating and works well under makeup. This also contains AHA to gently exfoliate the skin and with continued use this does keep my skin to look smooth and more refined. I love the glow this gives my skin to! Now this isn't a glowy primer, it's more of a smoothing and blurring one. It does contain Silicone, but don't let that put you off, I actually find this quite hydrating. It smooths over any dry areas and blurs my pore so full coverage foundations glide over the top. It also helps keep my makeup in place all day, without cakeing up or sinking into any fine lines. This is a super hydrating primer. It has Gold flecks in it that also give my skin a hint of radiance. I like to use this when my skin is particularly dry. It really keeps my skin plump looking all day. And full coverage foundations apply beautifully over the top. This is my favourite foundation at the moment! I believe this has been reformulated and it's so much better than I remember. The coverage is definitely on the full shade, it covers pretty much everything I want it to. At first I thought the formula was a little thick but it's really easy to blend. I say the finish is demi matte. With a dewy primer it looks more glowing. But more importantly it doesn't cake up. Or sit weirdly on my skin either. It stays in place all day to. It's fab. Regular readers are probably so bored of hearing about this foundation but it's just to good not to talk about. This is by far the best full coverage, dewy foundation I've come across. The formula is super light and so easy to blend. But the coverage is still there. The finish is definitely on the dewy side. So I don't think this will be for everyone but if you have dry skin I think you would really like this. Again, this is another one of my favourite foundations. While on initial application this isn't full coverage but it can easily be built up. The stick is so creamy and so easy to apply to the face. It literally gives me flawless looking skin in seconds. I'd say this this has more of a dewy finish but it can be mattifyed with the right primer and powder. This is a great solid, all round foundation. If matte foundations are your thing this foundation will be right up your street. This is the same as the LA Girl Illuminating Foundation but this one has a matte finish. Which it definitely does. It still offers full coverage in a super lightweight blend-able formula. I don't find this drying if I prep my skin well and use a good hydrating primer. But I do like to mix it with a few drops of Illumating Drops just because I prefer more of a dewy finish. But this is a great full coverage, affordable matte foundation. For concealer that doesn't cake up and stays looking flawless all day you wont get much better than the famous Shape Tape. The coverage is insanely good! One dot and this covers blemishes, dark circles, uneven skin tone, anything really. This never cakes up no matter how much I apply or how long I wear it. It's amazing. Powder for me can be a deal breaker. The wrong powder can simply make my base look awful! But thankfully this powder from Charlotte Tilbury is so finely milled it never looks cakey or powdery on the skin. This doesn't add much in terms of coverage but it sets all my base products perfectly. I also find this blurs my fine lines and pores, so while it doesn't add coverage it makes my base looking flawless. That's how I achieve a full coverage base without the cake. Have you tried any of these? 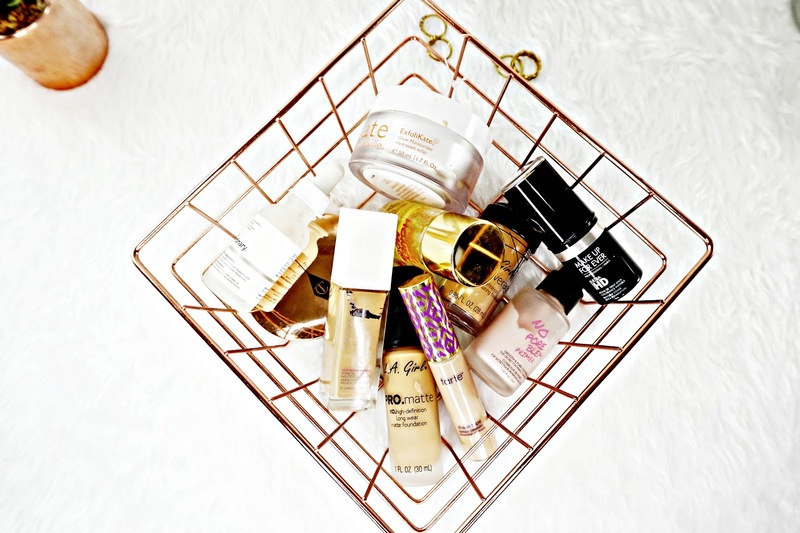 What are your full coverage favourites?